Advanced file renaming utility. Rename files, folders, sub-folders (even MP3 by tag) in any which way you want. Some of the renaming are almost impossible to be done, but NameWiz can be further expanded using plugins so you can rename anything you like, no restrictions. NameWiz is 100% network compatible. With NameWiz, you can rename files en masse in either a single folder or all sub folders. Change the file extension, make all names lower/upper case, replace, remove, insert, delete, move or swap characters, add prefixes and suffixes, or replace the names altogether with sequential names of your choosing. NameWiz is particularly useful for managing graphic files downloaded from the Internet or saved from your browser’s cache. Photographers will find NameWiz a must. It can also be useful for programmers or for those who create sequential versions of files, etc. Any files or folders can be renamed, no restrictions. 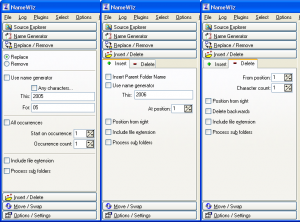 Create & Rename Folders: All what NameWiz can do does not only apply to files, in fact, you can rename folders in the same exact way you rename files. Beside renaming files, NameWiz can also create files and folders the same way it rename them. For example, create 5 years of monthly folders for your accounting software, say, 01-2003 to 12-2007. That’s too many folders to create manually. Let NameWiz do it for you in 1 second. Support for custom plugins is one of the main feature of NameWiz. Not only NameWiz can rename files in any ways you like, but it comes a time when you simply can not rename files the standard way. Plugins are easy to make and you need very little programming experience to make your own using one of our templates. We can also make plugins for you! NameWiz comes with an MP3 plugin which let you rename your MP3 files using the music headers, such as Author name, Album name, Song name etc. This plugin is a perfect example of why some files can not be renamed the standard way. lets you see the selected image. Supported file formats are TIFF images (*.tif; *.tiff), GFI fax images (*.fax), SGI images (*.bw; *.rgb; *.rgba; *.sgi), Autodesk images files (*.cel; *.pic), Truevision images (*.tga; *.vst; *.icb; *.vda; *.win), ZSoft Paintbrush images (*.pcx; *.pcc), Word 5.x screen capture files (*.scr), Kodak Photo-CD images (*.pcd), Portable pixel/gray map images (*.ppm; *.pgm; *.pbm), Dr. Halo images (*.cut; *.pal), CompuServe images (*.gif), SGI Wavefront images (*.rla; *.rpf), Standard Windows bitmap images (*.bmp; *.rle; *.dib), Photoshop images (*.psd; *.pdd), Paintshop Pro images (*.psp), Portable network graphic images (*.png). Errors, Undo and Log: NameWiz automatically checks for potential errors in real time, while previewing, alerting you if your naming sequence is correct or out of range. 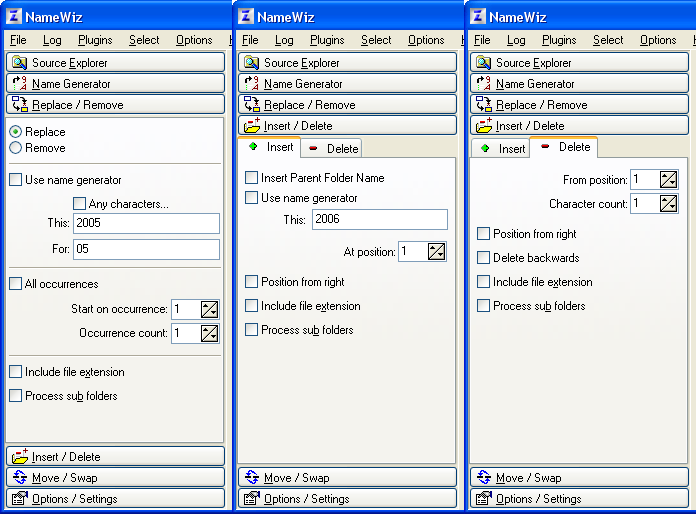 In case of mistakes or errors, NameWiz create an on screen editable log of everything you rename. You can undo from the log the last rename sequence, or all of the sequence registered since the log was last cleared. Source Explorer let you browse to the folder where renaming will occure. It works exactly like the Windows Explorer. You can select drives, CD-RW, network resource, flash memory cards, USB drives or any loaded peripherals. This Explorer is detachable from the window and can be made floating to ease navigation while renaming. Name Generator let you rename files sequentially. There are 3 ways you can do this. Numerically (0 to 9), Alphabetically (a to z) and Alphanumerically (0 to F) as set in the Settings and they can be edited to fit your needs. 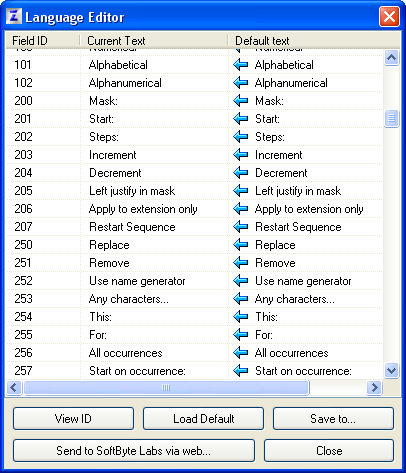 A Mask can be entered to pad the generated sequence to a fix length. Replace/Remove will let you replace parts of file names with a new one or using sequential names from the generator. Remove let you remove common parts of file names. Insert/Delete let you insert new or sequential text anywhere in a file name while Delete let you delete parts of file name based on position and can delete backwards. Move/Swap let you move around parts of file name, either by text or position. Swap will let you swap 2 areas of a file name, using text or positions. Options/Settings is where you set other things such as Prefix, Suffix, Capitalization and Alpha rules. 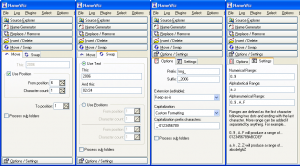 NameWiz can be customized in any which way you like by using Plugins. 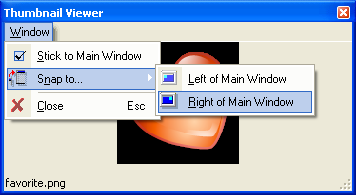 For example, the MP3 plugin and text viewer plugin included with NameWiz. If you are a novice or an experienced programmer, you can make a plugin in less than 15 minutes. We provide a plugin template for C++, Delphi and PowerBasic. All you have to do is fill in the blanks, write your renaming code and you’re done. If you are not a programmer or simply do not have the time to make your own plugin, we’ll make one, just let us know what the requirements are. Keep in mind that plugins can do anything, you need not restrict your plugin to renaming files only. 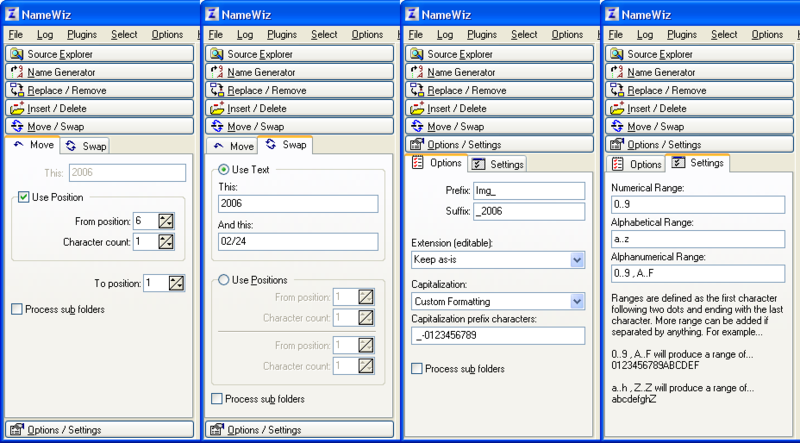 You can also run NameWiz in multi-language interface, all menus, dialog texts and messages. 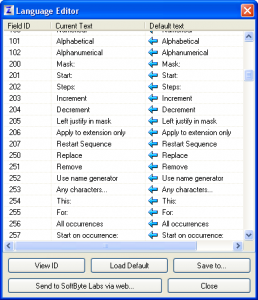 Create your own language by editing the language file directly using the NameWiz language editor. Owner license: $29.95 USD, include unlimited free updates and priority support.